AI package error missed when correcting the previous corrupted alias records. Added an extra failsafe in case the protection quest somehow starts but the aliases for tracking dragons are not filled. If the initial alias fails, an error will be logged. Citizens will be vulnerable to attack if this happens. It is not currently know why the alias fails to fill but chances are it's induced by mods which alter how dragons work. The package used to hold an NPC inside an interior if they're already there was rooting them in place, which looked strange in most cases. This has been changed to a "sandbox near self" package that should keep them indoors but allow them to conduct normal activity. Corrected a bad alias check in the MCM menu. Added MCM menu to make turning on the script debugging easier. Spawned dragons (from events, quests, the console, etc) whose form IDs start with FF will be handled through animation events now since there is too much risk that such a dragon could fly around and spit fire on stuff without ever perching or coming down to the ground. The perch and combat state triggers will now be reserved for use by dragons hand placed into the game by the CK, be they from mods or the vanilla game. They are generally not threats to populated areas anyway. All 136 dragon perch markers in the vanilla game that were flagged isFullLOD have had the flag removed so they can no longer trigger dragon events for any nearby cities, towns, or villages. Odahviing will no longer set off the system at all since allowing him to do so will disrupt the MQ as well as any city encounters you may call him into. Enabled on demand debug messages for use in troubleshooting. Fixed issues with dragons in distant cells triggering flee responses in Riften, Windhelm, and Whiterun. Complete replacement of the entire detection system. No longer uses wilderness encounter events. Dragons are now detected by combat state changes and when they land on available dragon perch objects in the area. 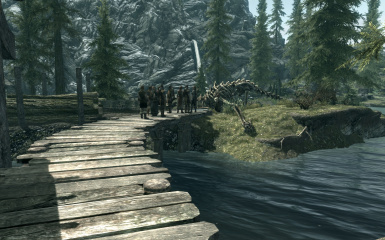 This results in more reliable detection of dragons no matter how they spawn, including unusual events generated by mods. When a citizen alias is filled, the AI pack will call for them to stop all combat activity prior to sending them to their safe harbor location. This should reduce the number of wannabe heroes. 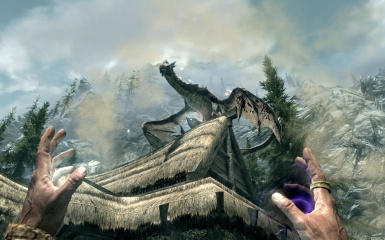 In the event a citizen STILL decides to play hero, as long as they are protected by essential status, entering bleedout will result in them being instantly healed for up to 75 health so as to avoid a possible scenario where the NPC could die if the dragon was killed while they're bleeding out. The check for child location status of an NPC's editor location was backward. This resulted in every NPC in an affected target area trying to cram into the inn instead of going to their houses like they were supposed to. Added a condition check to the aliases to make sure they only fill with unique actors. This should eliminate accidentally picking up nearby hunters or other leveled list NPCs that shouldn't be getting dragged in. Added a condition check to bar the player from filling an available citizen alias. Yep, for whatever reason, this happened in a few test runs. All edits to vanilla quest records have been purged as they are no longer necessary. The altered vanilla quest scripts will revert back to their previous states. Merged bugfixes from USKP 2.0.1 to the WEJS18 event in with the modifications RFYL made to the quest. Data corruption appears to have built up over time which has rendered the aliases used by the WIChangeLocation09 and WE04 protection quests worthless. New protection against "Corpses in the aftermath of a dragon attack, Dog left behind" (WEJS18) has been added since this triggered event can be called up near occupied areas. The cultists from Dragonborn should no longer be caught in the safety net. dunPrisonerFaction is now considered exempt, which the cultists are a member of. 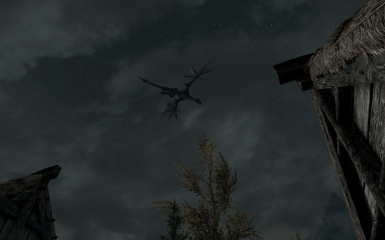 The script event for dragon attacks near settlements (WIChangeLocation09) will now trigger the flee response regardless of whether guards have line of sight on the dragon or not. Added support for random wilderness Player vs Dragon events (WE04 quest). Found and removed some rogue data which could have prevented the protection quests from launching. The protection quest is no longer triggered by the guards. The scene proved unreliable and so the quest now initiates when WIChangelocation09 hits stage 1. The AI for the flee packages has been updated to allow NPCs to retreat to the inn if the attack location has one. The system can now protect up to 150 NPCs in a given area. Skyrim patch 1.8.151.0.7 is now required for the mod to run. Small modification to the AI pack to only affect NPCs who are currently outdoors. If an indoor NPC steps outside, they should quickly end up back inside. Had to change the system somewhat. It now checks for "Habitation" locations and sends the NPCs to a "Dwelling" within that location. It was dumb to see NPCs flee Darkwater Crossing trying to run all the way to Kynsegrove. Expanded the coverage on the quest that runs the flee package to make all NPCs run for the inn instead of their editor locations. This now allows for NPCs who are stuck outdoors and would otherwise act even dumber than the farm animals. Moved the trigger point for the attack quest back to the first dialogue spoke by the guards so that the citizens will have more time to flee to make up for the distance and possible traffic jams before the dragon reaches the location. Raised the quest priority slightly to provide better coverage in the event other quests are being too assertive, and possibly causing unintended NPC deaths. Modified the citizen selection aliases to prevent player teammates and dismissed followers from fleeing the fight. The AI package has been changed to a "FleeTo" package since this will play the "duck and cover" anims while the NPCs make their way to the inn. The AI package has also been modified to block anyone currently in combat from fleeing to the inn until their fight is over. On the off chance there may be some within range of the attack, bandits and forsworn will not be covered by the system. Members of The Companions and/or Vigilants of Stendaar will not be covered by the system as these two factions would be considered fit to fight. Debug & Status MCM requires SKSE 1.7.1 (or higher) and SkyUI 4.1 (or higher) in order to use them. These menus are not necessary for the mod to run if you don't have SKSE and SkyUI. This mod has no continually updating scripts so the contamination of your save game will be minimal. A bad navmesh in an attack location can severely impact the ability of NPCs to clear the area. If you see any getting stuck and acting like they can't move, this is probably why. If the area is modified, you'll need to take this up with the author(s) of the mod(s) affecting the area. If the area is NOT modified (ie: totally vanilla) then please report such events so that I can pass them along to the USKP tracker to investigate.